On February 6, 2018, SpaceX successfully tested Falcon Heavy, the most powerful rocket that the American company ever built. When lifted off, it became also the most powerful operational rocket in the world. 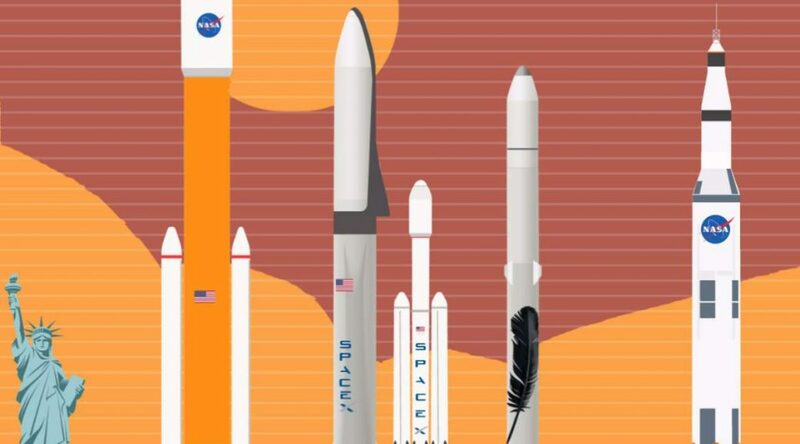 Powerful rockets like Falcon Heavy may one day carry humans to the Moon or Mars. But there might be an even more important use of powerful rockets like SpaceX’ Falcon Heavy and BFR, Blue Origin’s New Glenn or NASA’s SLS: asteroid mining. Lockheed Martin, the American global aerospace, defense, security and advanced technologies company has teamed up with NASA, to build the next generation spacecraft: the Orion, which is intended to carry a crew of four astronauts to destinations at low Earth orbit (LEO)Notes 1, or beyond, to Moon and even to Mars! Yesterday, the company published a video titled “Spotlight Space: How to Build a Spaceship”. The Soyuz (saw-yooz) is a Russian spacecraft. It was designed by USSR’s Korolev Design Bureau (now RKK Energia) in the 1960s, originally built as part of the Soviet manned lunar programs. The spacecraft remains in service today, and as of November 2017, all expeditions to the International Space Station use Soyuz vehicles Notes 1. One Soyuz is always remains attached to the station to allow a quick return in an emergency. The European Space Agency (ESA) published a series of videos titled “Journey to the International Space Station” explaining how astronauts and cosmonauts go to the ISS and return back to Earth. Here are the amazing three parts videos below. While Elon Musk and SpaceX planning to send Humans to Mars as early as 2024, the American global aerospace, defense, security, and advanced technologies company Lockheed Martin has also revealed animations of a reusable rocket to colonize the red planet. The American company has teamed up with NASA, to build a space station (Mars base camp) orbiting Mars and a reusable, water-powered lander. The goal is sending humans to Mars only in a decade. The space race 2.0 is on the way!